Summary: Viktor Frankl was an Austrian psychiatrist and a Holocaust survivor. 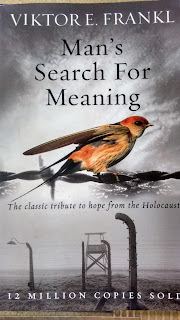 His book, Man's Search for Meaning, was originally titled, Nevertheless, Say "Yes" To Life, which I think makes a much better title for what the first half of the book recounts - Frankl's experiences during WWII as a prisoner in a concentration camp. The second half is an introduction to Frankl's theory of logotherapy. The basic premise of logotherapy is that the will to find meaning in life is a person's main motivation to go on. My thoughts: I struggle with books like these, non fictional accounts of tragedy and survival, because I can afford to be impersonal towards them. This does not go well with people. I have ineptly invited criticism on myself before, for instance, by accusing a certain teenage victim of the Holocaust of being too maudlin in her personal diary. This is why, of course, I had some reservations about "reviewing" Man's Search for Meaning by Viktor Frankl. But now I find myself overcome by a need to rant. To attempt a methodical presentation of the subject is very difficult, as psychology requires a certain scientific detachment. But does a man who makes his observations while he himself is a prisoner possess the necessary detachment? Such detachment is granted to the to the outsider, but he is too far removed to make any statements of real value. Only the man inside knows. His judgments may not be objective; his evaluations may be out of proportion. This is inevitable. An attempt must be made to avoid any personal bias and that is the real difficulty of a book of this kind. Frankl consciously tries to be objective and it is this tone that leads to reviews on Goodreads that accuse him of being too clinical. I disagree with the readers who call him dry and unemotional, because it is this very clinical precision that makes his writing visceral and honest. Frankl begins his narrative with a description of how some of them were chosen as prisoners, while others were sent off to be killed, their lives dependent on whims. How, upon arrival at the camp, all sense of dignity was stripped off and how awfully soon they got accustomed to their bare new existence. Much later, Frankl talks about becoming impassive to all the deaths. He adds that he would not even have remembered them now had he not been analysing his own reactions as a psychiatrist. A reader would have to be profoundly obtuse not to recognize how steeped in emotion such a confession is. "In front of me a man stumbled and those following him fell on top of him. The guard rushed over and used his whip on them all. Thus my thoughts were interrupted for a few minutes. But soon my soul found its way back from the prisoner's existence to another world, and I resumed talk with my loved one: I asked her questions, and she answered; she questioned me in return, and I answered. A thought crossed my mind: I didn't even know if she were still alive. I knew only one thing - which I have learned well by now; Love goes very far beyond the physical person of the beloved. It finds its deepest meaning in his spiritual being, his inner self. There was no need for me to know; nothing could touch the strength of my love, my thoughts, and my image of my beloved." The problem arises for me in Part Two, when he begins to preach. This is a man who has lived through a war, writing to men of that age, people who want to hear that their suffering was not for nothing, that having struggled on and survived through it with the right attitude gave their lives meaning. To form a method of therapy out of the undiluted terror they faced and to apply it to the considerably happier masses is rash. Simply put, his suggestion is to find a purpose at every turn in life to feel positively about, which sounds right. But based on the assumption that every happenstance has a meaning, including unavoidable misery, logotherapy is hopeful at best, and dangerously misleading at its worst. Because, like all self-help books, it is subjective. Disillusionment is the biggest vice to the former prisoner. Yet this disappointment felt when circumstance unchangingly delivers pain can be overcome, the book seems to say. But often, hope is a feeble self-deception in the face of an inevitable loss of control. The diligent search for meaning in everything could prove fruitless to an introspective cynic. And I could not, even if I wanted, apply to my life all the advice Frankl hands out in the latter section (the parts that do ring true and earn my utter admiration are evident in the first half anyway.) Add to this his ample criticism of Freud's psychoanalysis. In an age where questioning Freud is hardly new, Frankl's stubborn defence seems tedious. The first part of the book, as I have written already, is amazing. This second part is, as it helps, tiny. But I would advise you to read up on logotherapy before you decide to read it. Finally, I don't know if I want to recommend this book to people, it is a rather painful read. If you are interested in history or the war, do read it. For I must say, of the books on the Holocaust that I have read, fictional and otherwise, the memoir-ical half of Man's Search For Meaning by Viktor Frankl is by far the greatest. I think that it is OK to be critical of narratives that written by authors who write about and have experienced real life horrors and tragedy as one is just commenting upon ideas and writing. I had heard a lot about this book and have wanted to read it. In regards to the second have, I tend to like books that are full of ideas even if I disagree with the ideas. When I was younger I read quite a lot of books about the holocaust and similar monstrous events. Such narratives are difficult and do leave one with terrible mental images. I think that I am becoming less able to read such things as I get older. I read this book a long time ago, but that first half is what I remember, not in detail perhaps, but the impression it made on me. I have since noticed in other writing that as a reader, I add what is missing; if the text is very emotional, I supply reason; if the text is dry and cerebral, I feel more emotion. Perhaps this is what makes a maudlin account of real-life suffering so provoking to some of us: it does not make us feel as it encourages us, even demands of us, to feel. A great post, I wish I had more to contribute, but I am getting all too personal in all my attempts at wording a response. Your words about "hope is a feeble self-deception in the face of an inevitable loss of control" is spot on. I really enjoyed your review - well done! I have been considering reading this more because of the fact that Frankl was a psychiatrist (I've read more than my share of war memoirs). I will read up on logotherapy and - to be honest - I might skip part 2. Thanks for an excellent review. Great review, Priya, this is a book I would never pick up on my own and I'm not even sure I want to read. This is not the kind of horror I crave. That being said, I can see why it would be difficult to agree or even understand parts of it. We are well fed, comfortable and content citizens of this century. How can we truly understand those horrors? It doesn't seem surprising to me that he seems detached at some point - I guess he had to be in order to survive. Brian, thanks for your nice words. :) "I tend to like books that are full of ideas even if I disagree with the ideas." That is very true. You should definitely read this book then..
Viktoria, I see your point. But I see it as a matter of expression! A dry, distanced style of writing does not mean lack of emotion, but only a different way to expressing it... His style suits the content of the book, that is for sure. Megz, thanks! It is nice to have you here. I'd be very interested to know what you, as a doctor yourself, make of this book. Delia, that is exactly why I am not comfortable recommending this book to people. It is all too real.